Most of us would agree that taking care of our skin properly is very important. Given that your skin is the largest organ and certainly the most visible one, it can get rather distressing to witness your soft and supple skin slowly developing wrinkles and show signs of aging skin. In fact, the beauty and personal care industry has grown steadily, earning a “recession-proof” status. Sales in beauty and personal care industry is estimated to exceed US$150 billion by the end of 2017. Before we discuss how to delay aging, it is important to understand the physiology of skin and what happens to your skin when you age. One thing for certain: We cannot defy the natural aging process. With time, it is natural for our skin to lose its youthfulness and get visible lines on our face. Even without environmental influences, you will notice expression lines on the skin, fine lines, wrinkles, and pigmentation. Dry skin, fine lines, deep wrinkles, enlarged pores are all visible signs we associate with aging skin. 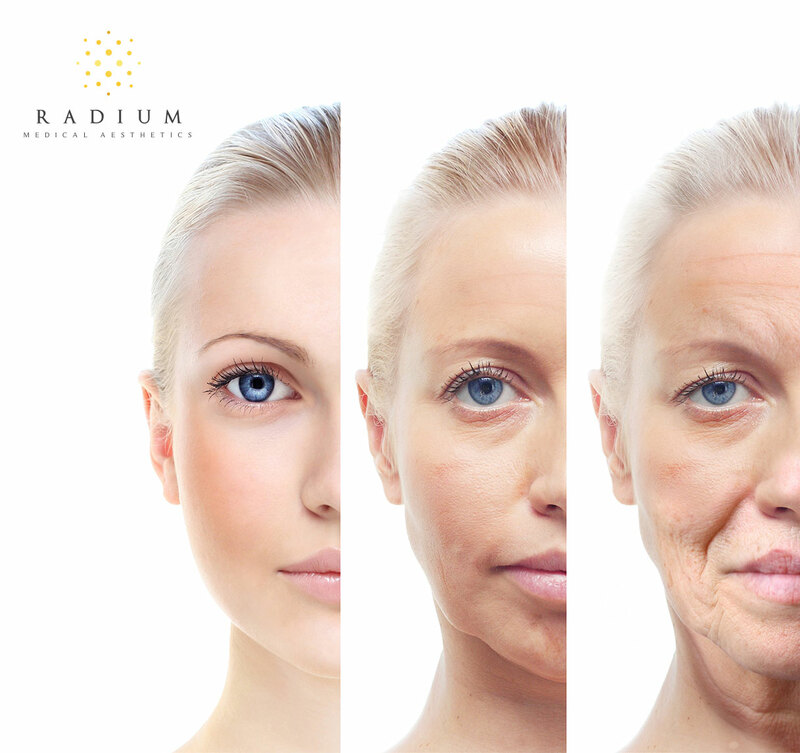 Learn more about the process of aging and find out what causes our skin to age. INTRINSIC AGING This is the result of changes that occur naturally in your body. Everyone’s aging process is determined by the biological clock that is predetermined by your genetic makeup. As we get older, our skin loses its ability to function as it once did. Your facial features lose their ability to retain its shape and position. Your nose becomes bigger, eyes become droopy, double chin forms and jowls develop. Young skin maintains a healthy level of moisture in the skin to keep it smooth and radiant. Regular skin cell renewal promotes new skin to be brought to the surface as old cells continually shed. 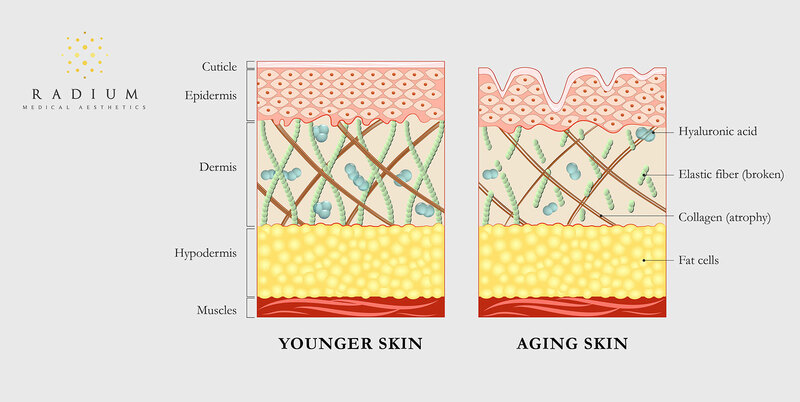 As we age, the rate of skin cell renewal drops, causing old cells to outnumber new cells in your body. Another important factor that causes your skin to dry out easily is due to the loss of moisture. The key molecule involved in providing moisture to the skin is Hyaluronic Acid (HA). HA has a unique property to bind and retain water molecules to make the skin soft and supple. There is a marked disappearance of HA as we age. There is progressive reduction of size and density of HA polymers present in the skin as a result of aging. Over time, the skin becomes thinner and more susceptible to environmental damage. Eventually, the skin appears dull and saggy. EXTRINSIC AGING One of the leading causes of aging skin is due to our environment. The environment plays a major role in causing our skin to age prematurely. Environmental aging occurs because of daily exposure to large amounts of free radicals from various sources such as UV rays, pollution, smoke, and extreme weather. These external stressors can damage proteins and the ability of cells to function and compromise cellular structure that will result in aging skin. UV rays and cigarette smoke compromise the development of collagen and elastin fibers in your body. It breaks down the moisture barrier, resulting in wrinkles, sagging, uneven skin tone, dry and dull skin texture. UV rays can penetrate the skin and damage collagen-producing fibroblast cells. Regardless of intrinsic aging or extrinsic aging, loss of firmness is another clear evidence of aging. Elastin fiber production slows down. Elastin fibers are the structural protein found in the dermis. 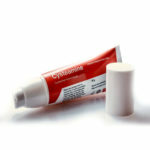 Elastin gives the skin the ability to go back into place after stretching. Without elastin fibers, the skin becomes less firm, especially along the jawline, neck, eyes, and cheeks. Fortunately, effective anti-aging skin lifting strategies exist to combat both intrinsic and extrinsic aging. An effective anti-aging regimen should be twofold: A mild, yet effective at-home skin care routine and a skin care program done performed and supervised by a medical doctor at a medical aesthetic clinic. Home treatments are beneficial for people facing early or mild skin sagging. Exfoliate your skin once a week with a gentle scrub to shed dead skin cells and promote blood circulation to your skin to restore the glow and smoothness. Staying hydrated and moisturise your skin help prevent fluid retention, and keep the skin cells plump and firm. If you find drinking at least 7 glasses of water a day is a chore, Radium Skin’s Serenity Skin Restoration Creme is the drink your skin will ever need. Containing nourishing plant oils and honey suckle extract, this versatile moisturiser calms and hydrates your skin, while repairing its natural barriers to prevent loss of moisture from your skin. There are very few serums or creams in the market that can effectively lift the skin. Megalift Skin Tightening Serum is just the skin care serum you need if you have mild sagging skin. It lifts sagging contours, reduces pore size, and erase wrinkles with strong skin-tightening botanical extracts. This powerful serum delivers anti-aging benefits with skin nourishing algae and Lactoballicus to lift, tone and restructure the skin. The extracts have been shown to support the formation of collagen-I, providing a holistic treatment for lax and saggy skin. There is very little result you can achieve if you only rely on home care treatments as they work only on the superficial layers of the skin. Complete anti-aging treatment should incorporate skin care treatments that address laxity in the the deeper layers of the skin. RESTYLANE SKINBOOSTERS This treatment works by delivering stabilised HA just under the skin using a series of micro-injections. HA is naturally found in the body that maintains hydration in the skin by absorbing water and bringing deep skin hydration to the skin. By refuelling the skin with the HA, it turns back the clock and reduces appearance of fine lines and wrinkles on the face and gives the skin a healthy, luminous glow. FACIAL DERMAL FILLERS Dermal fillers have become a popular way to add volume to hollow, deficient areas on the face and reverse signs of aging without surgery. With more advanced and versatile techniques, dermal fillers can be injected at different layers of the skin to provide longer-lasting, natural results for you. 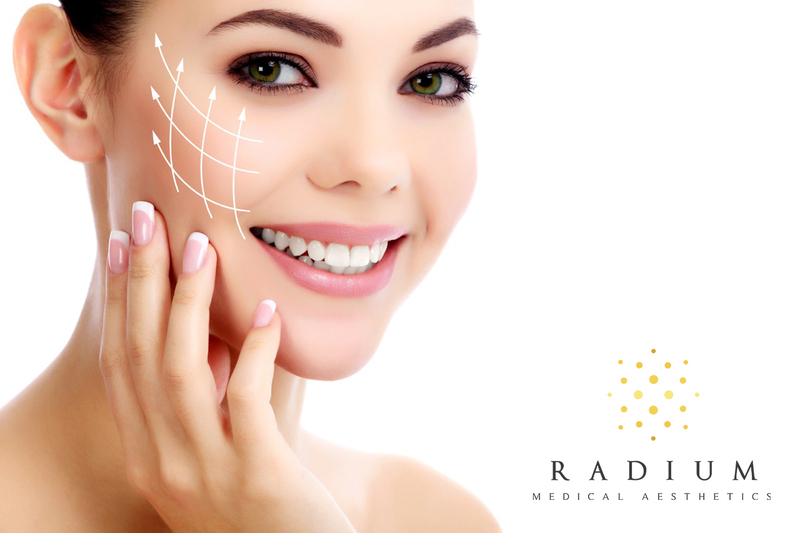 Dermal fillers, which are usually made of HA, can reduce appearance of fine lines and facial wrinkles, reverse mild skin laxity due to aging, and restore youthful volume to deficient areas due to aging. SILHOUETTE SOFT THREAD LIFT Silhouette Soft Thread Lift works on the deeper subcutaneous fat layer of the skin to pull the skin up. 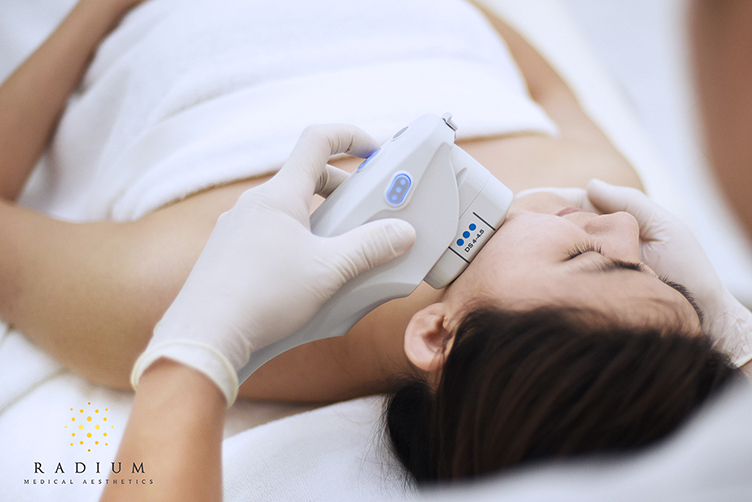 During the 45-minute treatment, it can achieve dramatic, immediate skin lifting through compression of fat tissue under the skin. Collagen stimulation is achieved because the threads activate fibroblasts to restore fullness and tightness to the skin. These special threads dissolve in about 12 to 18 months after the treatment. The skin lifting effects will still persist for another 6 to 12 months. Skin lifting effects will be prolonged much longer if you undergo the treatment again before the effect wears off completely. Read more about the treatment works. ULTHERAPY Ultherapy is the only FDA-approved non-invasive treatment for skin lifting and tightening. It uses focused ultrasound to lift, tone, and tighten loose skin. Although instant results cannot be seen after the treatment, it stimulates collagen production in your skin. Over the next few months, gradual tightening occurs, resulting in lifting of the face and tightening of the skin. Ultherapy is able to penetrate deeply and precisely into the foundational layers of facial tissue. It is designed to leave the superficial skin unharmed but tightens the deeper muscle layer, also known as the SMAS layer of the skin. This is the deep layer that cosmetic surgeons reach when they perform an invasive skin lifting surgery. The doctor places the Ultherapy tip to deliver focused ultrasound, which then leads to contraction of the SMAS muscle to stimulate collage production. Contact us if you like to complete your home care regime by incorporating anti-aging medical treatments to reverse the aging clock today.